This Wood Badge course will be an experience you will never forget! 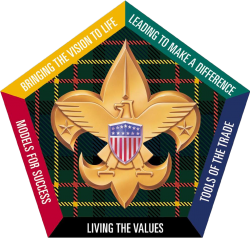 What is Wood Badge for the 21st Century? In 1911, Baden-Powell took the first steps in training Scouting's adult leaders by organizing a series of lectures for Scouters. He made great strides in the years that followed, culminating in 1919 with the establishment of Wood Badge training. Wood Badge recipients now number more than 100,000 and can be found in all corners of the world. Wood Badge is the advanced leadership and team-building training for adult leaders. The program is for Cub Scout, Boy Scout, Varsity Scout and Venture leaders as well as council and district leaders. Wood Badge for the 21st Century focuses on leadership, not outdoor skills. The 21st Century Wood Badge course brings together leaders from all areas of Scouting - Cub Scouts, Boy Scouts, Varsity Scouts, Venturing, and all levels of BSA's professional staff. Reflecting the best of nearly a century of Scouting experience, 21st Century Wood Badge also draws upon the most current leadership models being used by corporate America, academic circles, and successful outdoor leadership organizations throughout the country. Enhance leaders ability to train other leaders who can effectively lead their groups. Increase the number of units using small and large group models best defined by the patrol method. Increase the efficiency and effectiveness with which units operate. Leaders will be more effective working with large units comprised of many dens/patrols/adults giving more individuals the opportunity to lead. Improve retention of adult leaders through increased personal satisfaction and fulfillment.